Bitten Wants to be Re-Elected Based on This? Security has been hired to prevent a repeat of the disruption caused by Bitten and Haraldson Oct. 19, 2016. Everyone is welcome! This is all he has to offer? He obviously didn’t work hard to educate himself on the status of UBID as is evidenced by the videos regarding the EXPIRED 2011 WIA. He was completely ignorant during the discussion prior to voting to unilaterally enact the force majeure clause. He didn’t understand the motion just like he didn’t understand the motion put forward by Trustee Kaljur to strike a committee to determine the pros and cons of turning UBID over to the CVRD. 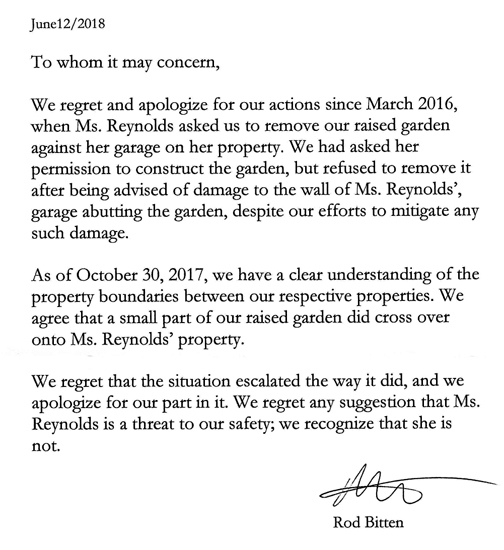 How can Bitten feel he is a valuable part of the Board of Trustees? What has he done? Again with the family being in the community for five generations. Big Deal. Being present doesn’t mean you are a suitable. What has Bitten done to educate himself? Bitten won’t show at the All Candidates meeting because he is ignorant of the issues and absolutely unable to face the electorate and answer questions. Anyone want to make a bet? What’s this about working with the developer as though KIP is the only player? KFN are interested in obtaining water for their lands and would be a much better arrangement with those who call the valley their home and care about the future rather than a developer who will no doubt flip the property and be long gone. Why can’t this developer pay the CEC’s as required and allow our government to control the purse strings calling the shots instead of lapping at his heels as though he is the Saviour? This guy has zero to offer as a candidate. He talks about the August 2017 deadline for a plan to submit to VIHA and time has slipped by. No kidding. 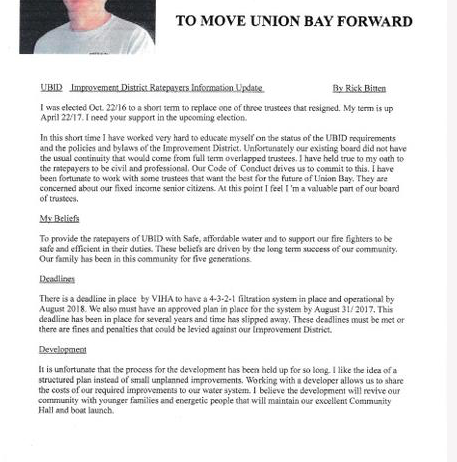 It was Bitten who told the community water wasn’t the most important issue facing Union Bay. This guy shouldn’t have gotten a single vote based on that statement alone. Vote for Susanna Kaljur and Ron Wheatley and get some pride back for Union Bay instead of the ridiculous comedy of errors run by Bitten, Jacques and Loxam. If this is what he has to offer…………….don’t waste your vote.